I had planned to write a long, juicy, drawn-out post about the delicious food in Malaysia, and in particular, the food in George Town, Penang. Then I suffered acute Mini Syndrome*. *Mini Syndrome is a curious affliction which happens when one drives a Mini. As a former Mini owner, I could only see Mini’s, when I was actually driving one. The same oddity has happened while riding motorbikes, driving lorries, and driving anything in the Australian Outback. Symptoms include moronic waving, awkward eye contact, exaggerated smiles and the right to act as a complete and utter goof. Returning to my original point; as soon as I sat down to write a post on Malaysian food, I realised the topic had already been covered. And more importantly, it had been covered by people who really know the subject well; rather than — like me — someone who had just sat down, and eaten. Having left New Zealand in somewhat of a hurry, I was gloriously ill-informed about travel in Malaysia. I opted for the rebellious, “Look, no guidebook!” approach. It’s in vogue, don’t you know? I like to tell people it’s because I’m something of a groovy travel hipster. Truth is, I’d just paid £90 for three weeks’ worth of travel insurance, so I figured that paying another £15 to keep me out of trouble seemed an utter waste of time and money. Nevertheless, I made the right decision. Prior to my arrival in George Town — the World Heritage capital of Pulau Penang (pulau is Bahasa Malay for island) — I’d done a quick recce of numerous travel blogs and filled my notebook with some morsels of information to guide me in my hour of need. I left my humble lodgings for a long walk and as planned, it culminated in the charming Kedai Kopi Sin Hwa* (Sin Hwa Coffee Shop) which I’d enthusiastically scribbled down during my research. As was normal for me in Malaysia, I smiled at the chef (in the smaller cafés, the chef is usually found cooking at the front of the café, not least so that you can discern the house special) and ordered my food before taking a seat at the back of the open-fronted eatery. There were ten tables covered in period world maps, and six weary ceiling fans tirelessly punching their blades through the air, delivering alternate wafts of pollution from the main road and spiced air from the wok. I’d ordered char koay teow, which is to Malaysians what a fry up is to we English. In a nutshell, it’s a little bit of everything: flat noodles, chives and bean sprouts, cockles, prawns and egg (optional), all fried together in a hot oil, soy and chilli paste. But somehow, it’s more than that. A beautiful old lady took my drinks order via a comical series of kindly exchanges, and I settled back and watched a handful of lonesome diners elegantly flick noodles into their mouths. The char koay teow (above) was so good, I ordered the bihun goreng (below) with the same trimmings, and a delicious home made lo hong ko (bottom; I can only guess it’s a drink made from honey, or perhaps a fruit) on ice. I was replete. Never had I been happier, than to just sit back and watch the world go by. A steady stream of locals schlepped along the road. Occasionally one would wander in and take a seat. It seemed an unspoken rule that they were having the char koay teow, and it seemed mandatory that it would be a trade of few words and solemn faces. My own expression, was one of boyish contemplation. People began to look at me and smile. I suddenly became paranoid. Continuously wiping my chin for fear of a stray noodle, or slither of chive. I wondered why I had been suddenly revealed from my dark corder at the rear of the coffee shop. 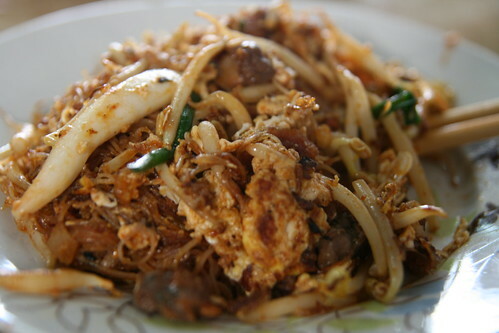 Having cheerfully consumed the char koay teow, and bihun goreng I was in the throes of Mini Syndrome. Suddenly, I was engaged in awkward eye contact with a gaggle of lunchtime diners, and I strained out a series of exaggerated smiles to appease my paranoia. For more great travel blogs, swipe your cursor through the forests of my T-Bag Travel Blog Directory. 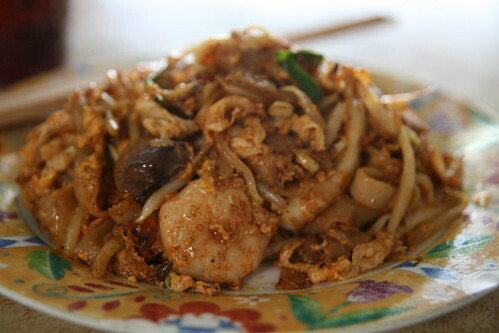 *Kedai Kopi Sin Hwa is located at approximately 328 Jalan Burma (Burma Road), George Town, Penang. I completely support the no guidebook approach! Glad to see it’s worked out well for you. The food looks incredible! The food in Malaysia is delicious. Sometimes, it pays to be in the know, but mostly you can’t go wrong. I tend to use a guidebook if I’m in a large country, and staying a while; India, China, Australia. But if the country is relatively small, and popular, like Malaysia, then the travel aspect practically takes care of itself. Scoff some next time you’re in Penang, you will not be disappointed. Any idea what the Lo Hong Ko is? I used to live in Penang and it’s truly a food paradise for me. So far only Taiwan tops Malaysia, when it comes to food. Thanks for sharing, brought back fond memories to me. I can see the appeal of living in Penang. I found it a really easy place to lose a day, and find a friendly face. The food is indubitably its most famous draw card, but many people don’t realise it’s also a beautiful and bustly place. I’m a big LP Guide Book fan — I really enjoy getting a background and overview on the countries, regions, or towns I’m traveling too. Like you though, I’m going at Thailand (and Bali) solo. I’d be lying if I said I didnt miss it immensely, but with the help of Twitter, an occasional browse of WikiTravel (great free resource), and of course many of the blogs in the T-Bag directory, I’m getting on okay. The only point I really *wish* I would have had the book was when looking for guesthouses in Bali. LP has done the dirty work and scoped out the best of the best – and when there are literally dozens in some towns ranging fowl to exceptional (all within the same aprox. price range), it’s great to have that dirty work done and sorted. “One more, please!” The food is a treat in Asia, I can’t remember one country where I was disappointed. Perhaps Nepal, where I was constantly swelled with daal bhat. I agree with the LP (other guide books are available) point of view. It can help you get straight to the point. If you haven’t got one for Thailand etc. I dare say you’ve borrowed one off other travellers, if only for cursory glance? I didn’t have one for Bali either, but I knew quite a lot of people there before I arrived because I was already travelling through Indo’ etc. If you’re ever back in Ubud, I liked the Wayan Family Guesthouse on Hanuman Street. Great value, and friendly. Oh sorry, to add to my comment above.. I think due to one of my deeeltd comments, to clarify more..This is indeed longan, but called mata kuching by locals due to the similarity to the real local variety.. In KL, u can see many Malay street vendors selling air mata kucing, which is actually dried longan infusion. The chinese dried longans :)So, u see, the local name for longans is mata kuching, altho from pomiculture point of view, mata kuching is longan, but longan is not mata kuching.A tiger is a cat, but a cat is not a tiger.Grrr… I’m being so long winded, but I just get long winded when issues like this come by, just like bayam and spinach issue. Or taro with yam. Malaysia in May! I’ can’t wait to eat eat eat while there 😉 Your post is making me hungry. You’ll love it, Brooke. CKT is just the tip of the iceberg with regards Malaysian food. You should, Zablon. In my opinion, Malaysian cuisine is some of the world’s best. Those noodles look fantastic, and filling. 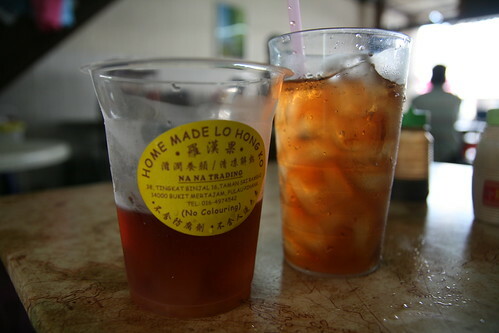 The drink that you had is pronounced as “luo han guo” in Mandarin. It’s a form of fruit. It taste good and it’s supposed to be good for you. Apparently the scientific name is Siraitia grosvenorii (or so wikipedia tells me – http://en.wikipedia.org/wiki/Siraitia_grosvenorii). Hope to hear more about your travel in Penang, and love that secret shot! Thank you for such a wonderfully warm comment, Nateniale. I had a wonderful time in Penang, and I’m sure it’s somewhere I’ll return to over the years. Terima kasih. The food looks incredible Ant! Was it spicy at all and Im glad you got over your mini syndrome. how to make your site mobile friendly? My web site looks weird when viewing from my iphone 4.
oof useful data, thanks for providing these kinds of information. This is a lot like that book, Ready Player Great job finding this! Thanks a lot for giving everyone remarkably pleasant possiblity to read from here. It is always so useful and as well , full of fun for me and my office fellow workers to search your website more than thrice in one week to learn the new things you will have. And of course, I’m just actually satisfied for the effective ideas you give. Some 3 points on this page are in fact the most effective I have ever had. I want to express appreciation to this writer for rescuing me from this particular condition. As a result of surfing throughout the the web and coming across proposals which are not powerful, I was thinking my entire life was well over. Being alive devoid of the answers to the problems you’ve sorted out by means of the article is a crucial case, as well as the kind which might have adversely damaged my career if I hadn’t noticed the blog. The understanding and kindness in playing with a lot of things was important. I’m not sure what I would’ve done if I hadn’t encountered such a point like this. I can at this point look ahead to my future. Thanks a lot so much for this impressive and sensible guide. I won’t hesitate to propose your web sites to any individual who should receive assistance on this situation. I and my pals were found to be taking note of the best helpful hints on your site and then instantly developed an awful suspicion I never thanked the blog owner for those tips. All the young boys are already so thrilled to study all of them and have in effect in reality been taking pleasure in them. Many thanks for getting simply helpful and also for using this kind of important subject matter most people are really wanting to know about. Our honest regret for not expressing appreciation to you sooner. I wanted to put you that tiny note in order to thank you as before for the nice opinions you have shown on this website. It is seriously open-handed with people like you to allow without restraint all most of us would’ve marketed as an e-book to end up making some dough for their own end, specifically since you could have tried it if you considered necessary. These tips likewise acted to be a good way to be certain that other individuals have similar desire similar to mine to realize a whole lot more when considering this condition. I am certain there are some more pleasant periods in the future for people who read through your blog post. I wanted to create you the little remark to finally give many thanks again regarding the wonderful tricks you have contributed on this website. It is really tremendously open-handed with people like you to deliver easily what a few individuals would have offered for sale for an e book to end up making some dough for their own end, even more so considering the fact that you might well have tried it in the event you decided. These basics in addition acted to become a easy way to realize that other individuals have a similar passion just as mine to learn a whole lot more in regard to this issue. I am sure there are numerous more fun occasions up front for people who read carefully your site. My husband and i were absolutely excited that Edward managed to finish off his researching from your ideas he obtained through your web site. It’s not at all simplistic to simply find yourself making a gift of things which often people might have been making money from. And we also realize we need the website owner to give thanks to for this. The explanations you made, the simple site menu, the relationships you can help to foster – it’s got mostly superb, and it’s really leading our son in addition to us feel that the idea is cool, which is truly fundamental. Many thanks for all! I simply wanted to write down a comment to be able to say thanks to you for all of the remarkable tips and tricks you are sharing here. My incredibly long internet search has finally been paid with pleasant details to exchange with my friends and classmates. I ‘d point out that many of us readers actually are really endowed to be in a useful place with many brilliant people with insightful things. I feel somewhat grateful to have encountered the webpages and look forward to tons of more entertaining moments reading here. Thanks again for all the details. I not to mention my friends were actually digesting the good advice located on your web page and then before long I had a terrible feeling I never expressed respect to the website owner for those strategies. My guys came absolutely happy to see all of them and have now in reality been taking pleasure in them. We appreciate you genuinely simply thoughtful and then for deciding on this kind of remarkable topics millions of individuals are really desperate to understand about. Our honest regret for not saying thanks to sooner. Thanks for all of your labor on this site. My aunt really likes getting into internet research and it’s really simple to grasp why. We all notice all concerning the compelling means you render simple steps through your web site and in addition improve participation from some other people on the point then our princess is now being taught a great deal. Take advantage of the remaining portion of the year. You are performing a really great job. I must convey my admiration for your kindness in support of those people who require assistance with the area. Your personal dedication to passing the message throughout came to be extraordinarily useful and have really enabled men and women just like me to reach their desired goals. Your own valuable help and advice indicates much to me and somewhat more to my fellow workers. Thanks a lot; from everyone of us. Thanks so much for giving everyone such a marvellous opportunity to read from this blog. It’s usually so pleasing plus jam-packed with fun for me personally and my office colleagues to search your website at a minimum 3 times in a week to read the newest secrets you have. Of course, I am also certainly fulfilled considering the breathtaking methods you give. Selected 4 ideas in this article are truly the best I’ve ever had. I enjoy you because of all of your effort on this web page. Kim takes pleasure in setting aside time for investigation and it is easy to see why. Most people learn all of the powerful medium you offer rewarding items via your web blog and even invigorate contribution from other people on the topic so our simple princess is really understanding so much. Have fun with the rest of the year. You are performing a superb job. Thank you for all your efforts on this website. Ellie enjoys making time for internet research and it’s really easy to understand why. A number of us learn all relating to the lively method you provide priceless things on this web blog and as well as recommend participation from other ones on this situation while our own child is actually discovering a whole lot. Take advantage of the remaining portion of the year. You’re performing a very good job.